Five years ago Image City Photography Gallery opened its doors in the Neighborhood of the Arts exhibiting photographic art exclusively. 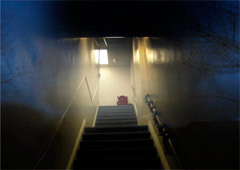 Since that premier, Image City has produced 65 exhibits featuring the work of hundreds of photographers that has covered the gamut of photographic genres, techniques, and styles. We are extremely grateful to the photographic talents of the photographers and the visitors and patrons who have supported us over the years. We are especially pleased to name the current exhibit our 5th Anniversary Show as a demonstration of our endurance and persistence to be able to consistently show exeptional photography in the image city, Rochester, NY. For this anniversary show we have brought together the current gallery partners and special guests from the gallery's history: Bill Bernbeck, Daniel P. Crozet, JFK/AJVK, Joel Krenis, Steve Levinson, Gil Maker, Peter Marr, Don Menges, Dan Neuberger, Jim Patton, David Perlman, Betsy Phillips, John C. Solberg, Gary Thompson, Phyllis Thompson, Sheridan Vincent, and George Wallace. 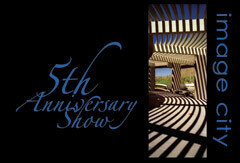 Joining us are guest photographers Kim Denman, Helen Ellis, James Trenton Francis, Donita Painter, and Lou Ryen. Award-winning photographers from Camera Rochester competitions are Donald Dunn, Earl Jackson, David Kotok, Lois Trieb, and Michelle Turner. During the 5th Anniversary Show the Gallery will forgo its commissions on all sales to allow each of the exhibiting Artists to donate the equivalent amount to Quad A for Kids. Quad A for Kids offers programs for Rochester's urban youth outside the normal school hours in a safe environment with caring adults. Our own Jim Patton, Artist-in-Residence, is the Chair of the organization that provides children the opportunity to participate in a variety of social activities that promote teamwork, sportsmanship and academics throughout the entire year. Note August 6 is First Friday Gallery Night, Image City is open until 9pm. One of our partners, Gil Maker, is the Rochester walk organizer for the Scott Kelby Third Annual WorldWide PhotoWalk. If you would like to take part in this world wide event, CLICK HERE to see the details of the Rochester Photo Walk and follow the instructions to sign up for the event. It's this Saturday, July 24, from 2 until 4 pm. Peter Marr has reviewed all of the photographs in the show and has picked three of his favorites from the photographs by the guest photographers in the 5th Anniversary Show. For each of "Peter's Picks" he writes a review, and we have excerpts from his discussion here in the newsletter. You will want to go to the webpage link to see larger images and the full write-up, or, certainly better, be sure to visit the gallery to see them in person. In introducing the show Peter commented "The famous English novelist and dramatist, William Somerset Maugham once said, 'It's a funny thing about life. If you refuse to accept anything but the best, you often get it'. He was absolutely correct when it come to this eclectic 5th Anniversary Show, for the Gallery has put on an exquisite, masterful exhibition of photographic art, that is a memorable tribute to the multi-talents of the gallery partners, artists-in-residence and guest artists." Peter chose An Armed Chair by JFK/AJVK commenting "This is a very creative, expressive print, which the longer you look at, the more that you see, or maybe, imagine that you see. I am reminded immediately of two of my favourite quotations, namely, 'Perception is personal, we see what we see', by Richard Fahey, and 'A photograph is a secret about a secret, the more it tells you, the less you know', by Diane Arbus...... It is left to the viewer to delve more into the mystery and fascination that this print evokes, certainly to use one's imagination and sense of wonder. This is an outstanding, thought-provoking image." commented that "Lou's photographs creatively and elegantly, capture the rich tradition and charm, only found in European locales. The legendary photographer, Diane Arbus, once remarked that, 'I really believe there are things nobody would see if I didn't photograph them'. This is especially exemplified by Chic Ladies Only, a scene which the vast majority of people would not choose to photographically record. Happily for us, Lou saw the magic and fascination in the 'slice of life' in an Italian lakeside apartment, and captured for us this memorable print." With John C. Solberg's Birds on a Wire, - at left - Peter felt that "photographically, this image is superbly captured and printed, with a range of tonal values from full black to pure white. The print exudes a wonderful rhythm of lines, textures and values, with a particular sensitivity that really suits the subject matter. 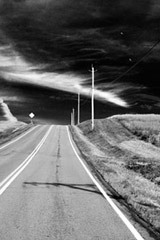 The details and essence of the road surface and surrounding vegetation are heightened by the dramatic dark sky and the diagonal shaft of a streaking cloud. ..... One wants to enjoy every moment admiring the foreground, but the real intrigue is in what lies over the hill, and where does the road and line of poles lead us? Then, and only then, do we realize the deep significance of the two birds. They can see what is beyond, a decided advantage, one we wish we could emulate. A stimulating , creative and masterful image." For the last couple of months, we have had a good turnout for Image City Critiques, a new, free program we offer at the Gallery to provide participants an opportunity to review their photographs and participate in a friendly, constructive, and positive critique. The sessions are held on the first Wednesday of the month and the next is Wednesday, August 4th from 7:00-9:00 pm. If you'd like to join us, please bring 2 or 3 jpg images that are at most 1MB in size and at most 1500 pixels on the longest side. You may also bring them as a print, on a CD, or on a thumb drive. If you have any questions please contact Don Menges (dmenges@rochester.rr.com) or Gil Maker (gmaker@mac.com). We look forward to meeting with you on August 4 at 7pm. Over the years I have been trying to make images at Jordan Pond, in Acadia NP, Maine by using rounded foreground rocks to echo the rounded mounds of the two dominant mountains called "the Bubbles". On most of those attempts I struggled to maintain my balance while straddling other rocks in order to secure a position for achieving good composition. In most instances I ended up in unbalanced, precarious and contorted positions. This uncomfortable state detracted from my ability to concentrate on positioning my tripod and camera in order to properly compose an image. My hiking boots were usually too low to walk in the water, and when I went barefoot, being a tenderfoot, I invariable cut up my feet. In July of 2008 I solved the problem by purchasing a pair of wading sandals. The sandals enabled me to easily walk around in the water with good stability. I was then able to comfortably maneuver my photographic equipment and experiment with different image compositions. The sandals are now part of my regular equipment whenever I do lake or stream photography. They work great in Spring, Summer and up to mid-Autumn. The ability to comfortably move around in the water opens up more perspectives for finding different positions to make creative images. It gives the sandaled photographer an advantage over other photographers who are restricted to terra firma. 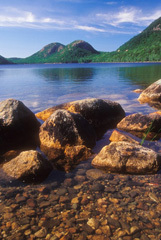 My example image is entitled The Bubbles of Jordan Pond. Click Here to see a larger image of The Bubbles of Jordan Pond and to review the other photographs in the series and the tips Gary has written. August 4, 2010 Image City Critiques begins at 7pm at the Gallery.